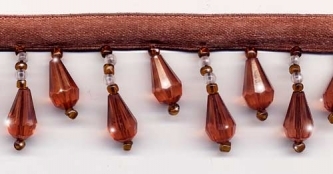 From our Beaded Drop Collection: This richly colored Beaded Fringe trim in sparkling translucent muted orange terracotta reminds us of the clay pots you might find at an Italian Villa in Tuscany. Absolutely beautiful faceted teardrop beads with seed beads in clear warm terracotta and frosted ivory. This is a high quality, very full beaded fringe with exceptional detail and craftsmanship. The longer beaded stands are 1" long, not including the rich brown satin ribbon. This is an impressive and rich popular color. Fabulous for trimming draperies, lampshades and home decorations!